Stan Sakai created his first Usagi Yojimbo story in Steve Gallacci’s Albedo: Anthropomorphics #2 comic book, November 1984. Only 2,000 copies were printed. From there, Usagi Yojimbo has grown to become a very famous comic book, traveling through several publishers, the most recent being Dark Horse Comics since 1996. The comic has always been written and drawn by Stan Sakai. During that time, he has become one of the most popular artists in the professional comic-book community, for his friendliness and readiness to join in numerous benefit projects. 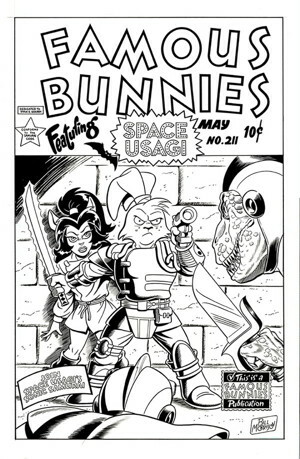 When furry fan artist Michael-Scot McMurry was dying of cancer in 2000, he drew the cover for a benefit comic book for McMurry’s expenses for an operation, showing Usagi and McMurry’s Zonie the coyote fighting monsters. Stan has often been an attendee of furry conventions, sometimes with his wife, Sharon, and their two daughters. I remember one convention, probably a ConFurence in the mid-1990s, where Stan’s daughter Hannah, then about 3 years old, tried to climb up Kjartan Arnörsson, a lean 6'9". Stan was a member of Rowrbrazzle, the furry amateur press association, from 1990 to 1998. He is a member of the Furry Hall of Fame. His Usagi Yojimbo won the Ursa Major Award in the Best Anthropomorphic Comic Book category in every year from 2001 to 2005. He has also won non-furry awards such as the Eisners, a Parent's Choice Award, the Comic-Con's Inkpot, Spain's Haxtur Award and many others. He has been a furry convention guest-of-honor on three continents, at an Anthrocon, a EuroFurence and an Australian MiDFur. If you have not heard – it has been widely publicized - Stan’s wife Sharon has had an inoperable brain tumor for the past decade. It was mild at first, but has gotten progressively worse until she is now confined to bed and in need of round-the-clock care. 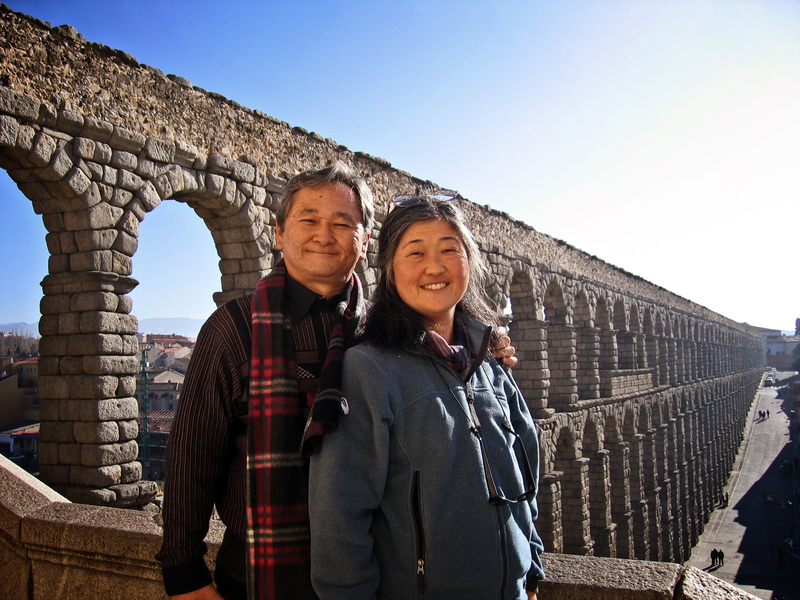 The Sakais have medical insurance, but their medical expenses have far exceeded the amount of the insurance. Dark Horse Comics and the Comic Art Professional Society have organized The Sakai Project, this 160-page hardcover book, to both celebrate Usagi Yojimbo’s 30th anniversary and as a benefit project for the Sakais’ medical expenses. All proceeds go to them. Dark Horse is not even reimbursing itself for the printing expenses. By various, foreword by Mark Evanier, preface by Tone Rodriguez, Milwaukie, OR, Dark Horse Books, July 2014, hardcover $29.99 (160 pages). This is a collection of all twelve of Stan Sakai’s Nilson Groundthumper comic-art short stories, in an attractive hardcover full-color “graphic novel” format. 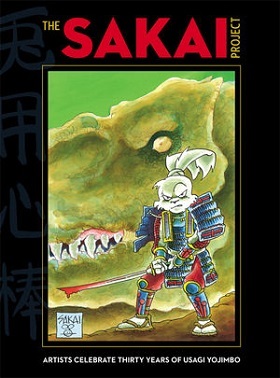 Sakai is most famous for his ongoing series about Miyamoto Usagi, the rabbit ronin in the early 1600s Tokugawa shogunate in an anthropomorphized-animal Japan. Most people who know about Sakai’s Nilson Groundthumper series think of it as Sakai’s series just before the adventures of Usagi Yojimbo, but they were actually mostly contemporaneous. The first Nilson short story was published in Albedo: Anthropomorphics #1 in 1984; the first Usagi story was in Albedo #2. 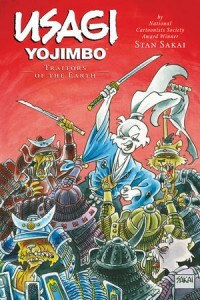 The two alternated briefly, then Sakai concentrated on Usagi Yojimbo with an occasional Nilson story as a backup feature, or when Sakai wanted to do a standalone short story for a different magazine. Most of these were first published between 1985 and 1994, with a final story in 2013. Milwaukie, OR, Dark Horse Books, March 2014, hardcover $14.99 (109 [+3] pages). 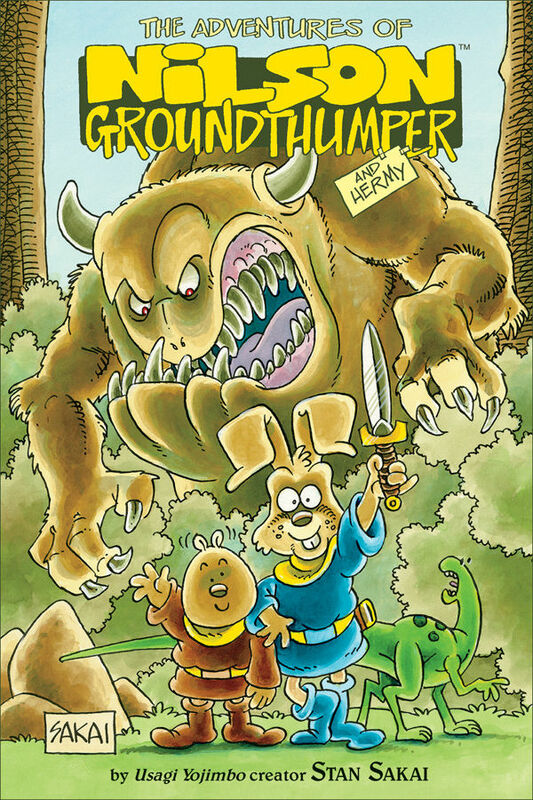 This coming March, fans of Usagi Yojimbo will once again be able to check out one of creator Stan Sakai’s other well-known funny animal creations, Nilson Groundthumper (and his assistant Hermy) in a new full-color hardcover collection from Dark Horse Press. “Experience the rabbit action epic that might have been! More than just a precursor to Stan Sakai’s beloved Usagi Yojimbo, his tales of medieval un-wits Nilson and Hermy are every bit as funny, exciting, and beautifully illustrated as the saga of the familiar rabbit ronin!” Collecting Nilson and Hermy’s complete exploits, the artwork is scanned from Stan Sakai’s original black & white artwork and newly colored by Usagi colorist Tom Luth. 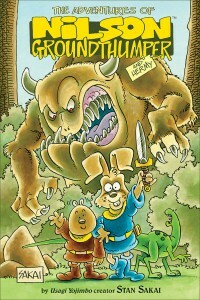 Check out The Adventures of Nilson Groundthumper and Hermy (an pre-order it) at the Dark Horse web site.